- Creative Loafing Magazine, Best of the Bay - 2009, "Most Unassuming Monster"
Acoustic "fingerstyle" guitar wizard Shaun Hopper is at first glance an unassuming presence, a true southern gentleman whose humility stands in stark contrast to the prodigious talents he unveils on stage. An unparalleled master of the fret-board. Merging complex melodies, harmonies and bass lines along with a one-of-a-kind mix of percussive elements, he captivates everyone within earshot. Whether his listeners are guitar enthusiasts or not matters little, within a few seconds they soon realize that they are listening to a true virtuoso. Hopper's original compositions and arrangements of pop tunes are infused with all the cutting edge techniques and flavorings embraced by the new breed of You-Tubesensations, including influences like Adam Rafferty, Andy McKee and Don Ross. Yet, it is his traditional and schooled "approach" to music which keeps him unquestionably steeped in, and inspired by, the greats. Influences include guitar legends; Chet Atkins, Andres Segovia, Tommy Emmanuel, George Benson, Michael Hedges, Martin Taylor, Buster B. Jones, Pete Huttlinger and Leo Kottke, just to name a few. The final result is a signature style which crosses over the full range of musical genres; Folk, Classical, Celtic, Pop, Rock, Jazz, Blues and Percussive-New Age. Shaun has made his mark opening for acts like "The John Jorgenson Quintet" (Elton John), Bobby Yang, Pierre Bensusan, The California Guitar Trio, Muriel Anderson & Tierra Negra, G. Love and Switchfoot. He has toured with Tim Reynolds & TR3 from the Dave Matthews Band and has co-written songs with Tommy Emmanuel. He was recently signed to Steve Vai's Favored Nations/Digital Nations label (Fall 2010) which included the release of his debut CD, "Lower Case Letters". Shaun has held several Guitar Clinics through Sam Ash and has received sponsorships and endorsements from Maton Guitars, Larivee Guitars, Keeley Electronics, TC Electronic, Radial Engineering, Elixir Guitar Strings, L. R. Baggs, Voodoo Lab and Zaolla Instrument Cables. Born and raised in Adel, Georgia, Shaun began playing guitar at age 12 after hearing a local street musician fingerpick a Nirvana song outside the local arcade. That's all it took to light the fire. Within weeks, family friend Dan Madock (a.k.a., "Doc" ), presented Shaun with his first instrument, an Ibanez 6-string. A sequence of influential teachers soon followed, broadening Shaun's exposure, including Bill Brown (Music Theory), Nephtali Santiago (Classical Method) and later, extensive lessons with mentor Sam Pacetti (Folk, Celtic & Fingerstyle). Shaun speaks fondly of Pacetti's influence, "Sam Pacetti is a true virtuoso. He's just amazing. You think he's reached a level where he can go no further and he just keeps getting better". Ironically, the same exact sentiment is now being sounded across Hopper's own fan base (which now includes Pacetti). His early exposure provided him with a firm foundation in classical music theory, an awareness of the full range of possibilities on guitar and an unvarying passion for practicing his craft. Starting out in 2002, Shaun played bass in several rock & country bands, cutting his teeth at local Valdosta clubs, touring the Southeast and gaining a popular foothold in Atlanta. Yet even after playing a four hour band gig, he'd arrive back at the motel room at 3:00am, put away his bass and open up his guitar case. Locking himself in the motel bathroom, so as not to disturb his band mates, he'd play for several more hours. His call to "solo fingerstyle" guitar was resolute. Subsequent years of honing his craft led Hopper to the "Winfield National Fingerpicking Championship" where he won "Best Instrumental" song (2007) for his seminal piece "Autumn of Any Year". Later that same year, Shaun won 2nd place in the singer-songwriter competition at Atlanta's famed Eddie's Attic "Shootout Competition" without singing a single note, being the first and only instrumentalist ever to achieve such recognition. Reviewer's from "The Atlanta Journal Constitution" awarded Shaun the title "Best Musician on the Rise" (2007). Today, Shaun is pursuing his own compositions (including songwriting) as well as learning arrangements and compositions from some of the best guitarists on the planet. He is undaunted at every challenge, citing "time" as his only obstacle. Whether the arranger/composer is Martin Taylor, Pete Huttlinger, Tommy Emmanuel or Adam Rafferty, Shaun meets them head on imbuing each tune with his own signature. Reflecting on his favorite guitar players, "You have to keep playing if you want to reach those next levels," Hopper says. "You have to make time to practice or it won't happen." His words echo his daily ritual and the results are self evident. Shaun jealously guards his practice time, exploring the genius of his idols as well as his own conduit of creativity, whether cloistered away at home or sitting in a booth at Perkin's Restaurant at 3:00am. 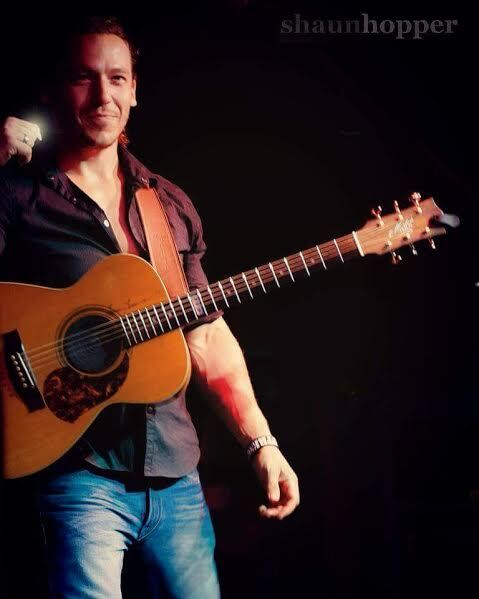 Shaun Hopper is unquestionably one of the finest acoustic-fingerstyle guitar players in America, a rare jewel in the tapestry of the Tampa Bay music scene. Dazzling us with his fiery originals and covering everything from Chet Atkins to Andre Segovia and from The Beatles to Queen, Shaun never fails to mesmerize us all.